James Pine has his heart set on empowering the Oglala Lakota, both young and old. And Pine, 23, of Rapid City, has been awarded a $10,000 grant to take his desire and run with it. He is one of 10 recipients of the Dreamstarter grant program, which is administered by Running Strong, an American Indian youth nonprofit based in Alexandria, Va.
Each of the 10 awardees received $10,000 to start youth camps promoting health and wellness across the nation. Each will work with a mentoring nonprofit to help implement their startup camps. Pine, who works at Dakota Business Center delivering office supplies and installing office furniture, will be working with Dustin Martin, program director for Wings of America in Santa Fe, N.M.
Born and raised on the Pine Ridge Indian Reservation, Pine knows firsthand the problems that people there deal with daily. This summer, Pine said, he will be starting a series of two-day youth camps, dubbed Lakota Forever Running and Fitness, in eight communities across the reservation. He hopes to start the camps in June, continuing through August. Pine is a former state-qualifying cross-country and track runner for Pine Ridge High School. 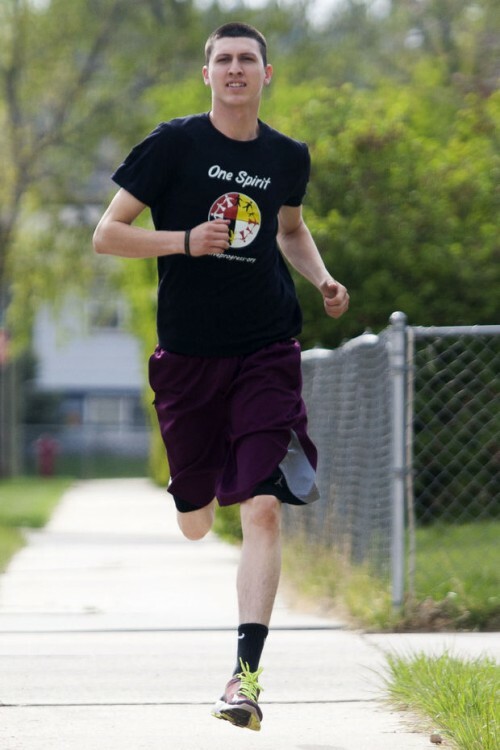 “Running has helped me in a major way, and I don’t even know if I can put it into words, but it was just an awesome thing because when I was younger, growing up on the Pine Ridge Reservation, I went through the hardships, just like everyone else,” he said. Running Strong was co-founded by 1964 Olympic champion Billy Mills, an Oglala Lakota from the Pine Ridge Indian Reservation, who to date is the only American to win a gold medal in the Olympic 10,000-meter run. Pine applied to the Dreamstarter Program with friend and colleague Martin. The duo met last summer at a Wings of America program that trained Pine and others to facilitate youth running and fitness camps. Pine’s father, Dale, has been a long-time supporter of Wings of America running and fitness programs, Martin said. Dale Pine has coached at Pine Ridge High School for more than 25 years. He is a leading force of Team One Spirit, which facilitates running programs and raises funds for youth on the reservation. The team sent James Pine to run with four other Oglala Lakota runners in the New York City Marathon. The group is collectively called the Lakota Five. Pine finished the 26-mile, 385-yard race with a time of 3:52:31. Partnering with Pine to start running camps at the Pine Ridge Indian Reservation is a natural transition from an already strong partnership, Martin said. Pine said Wings of America has granted him an additional $9,000 to start the Pine Ridge running camps, which he said will incorporate games, mentorship and wellness education, all the while promoting the sport of running. Pine said he will coordinate with schools on the reservation to see what gym space is available for his camps, though there’s always the option of holding them outdoors. He said he will also be seeking sponsorships from local businesses. This entry was posted in Health, Sports and tagged American Indian Youth, Billy Mills, Dreamstarter, Health, James Pine, Lakota Forever Running and Fitness, Native American Youth, Native Youth, Oglala Lakota, Pine Ridge Indian Reservation, Running Strong, wellness, Wings of America by admin. Bookmark the permalink.